Having planned a short trip to Zurich, I decided to see if Amazon had any guide books specifically for Zurich and found only one: Cityspots Zurich. It hadn’t yet been rated but seemed worth ordering. 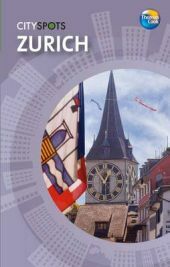 The book is divided into five main sections, Introducing Zurich, Making the Most of Zurich, The City of Zurich, Out of Town and Practical Information. There is an index at the end of the guide, but maps are interspersed at appropriate places. The abundant colour photographs give a feel for the place even though some of them are quite small. I didn’t read much of the introduction, although I was interested to find out that the Dada movement had originated in Zurich. This section also gives a brief history of the city, an overview of its lifestyle and culture, and a useful month-by-month listing of annual events in Zurich. The next section on Making the Most of Zurich looks first at shopping, then at eating and drinking, followed by entertainment and nightlife. These do seem rather generalised, but the next sub-section on sport and relaxation lists a fair number of activities. The sub-section dealing with accommodation suggests nineteen hotels in three different price categories. My comment here has to be that for the Helmhaus Hotel where I stayed, the book says ‘Ask for a room overlooking the river'; the hotel is close to the river, admittedly, but the rooms do not overlook it. Making the Most of Zurich continues with a brief look at Zurich’s top ten attractions. I was lucky enough to see five of them in twenty-four hours, namely Lake Zurich, the Bahnhofstrasse, the Fraumunster, the Grossmunster and Niederdorf. I would gladly have swapped the Bahnhofstrasse for a visit to the Uetli Mountain had time permitted, but the sights I did see were certainly worthy of a top ten listing. The section also suggests ideas for activities that are free of charge and things to do when it rains. I did not need to consult the latter part as I was lucky to have sunny weather. Practical information on transport concludes the section; I was glad to discover here that it was easy to take a train from the airport to the city centre. The section on the City of Zurich focuses on three distinct areas: central Zurich, Niederdorf and beyond, and Zurich West. For each area there is a little information on the main attractions as well as shops and restaurants, with an indication of how expensive they are. We didn’t have time to visit Zurich West at all, but it was in Cityspots Zurich that we found out about the Lindenhof and its wonderful views, as well as the Zeughauskeller, considered to be Zurich’s top beer hall. Out of Town was not relevant to me as my time was so limited, but my son and his partner were able to make a day trip to Lake Lucerne and Mount Pilatus, having been inspired by the information and pictures in this section of Cityspots Zurich. The book also suggests Rapperswil on the eastern shore of Lake Zurich as a worthwhile place to make a trip to. Details of accommodation in Lucerne and Rapperswil will be useful for anyone wanting an overnight stay. Practical Information is a rather concise but important section that concludes the book. A few details are given on how to travel to Zurich, its currency, opening hours and so on. Information is given on suitability of the city for children as well as facilities for disabled travellers. The section also includes emergency telephone numbers, locations of a pharmacy, hospital and dental clinic, and a list of embassies and consulates for English-speaking countries. Cityspots Zurich is a small format and with just 144 pages is light enough to carry around. A few useful phrases in German with a pronunciation guide are given on the inside covers; we found that almost everyone spoke English, but it is still worth making the effort to respond now and again in the local language. One criticism is that I didn’t find the maps in the book detailed enough, but I was able to print one from the Internet that showed the way from the railway station to our hotel, and once in Zurich it is easy to get hold of a large map free of charge. If you are making a visit specifically to Zurich I would definitely recommend buying this guide. If, however, you are travelling to other parts of Switzerland as well it would be preferable to have a guide for the country as a whole. I don’t regret buying Cityspots Zurich in the least, even though I needed larger maps. The photographs did make me feel that I had chosen the right destination, and I still enjoy looking at them after returning home. No Comments on "Cityspots Zurich"